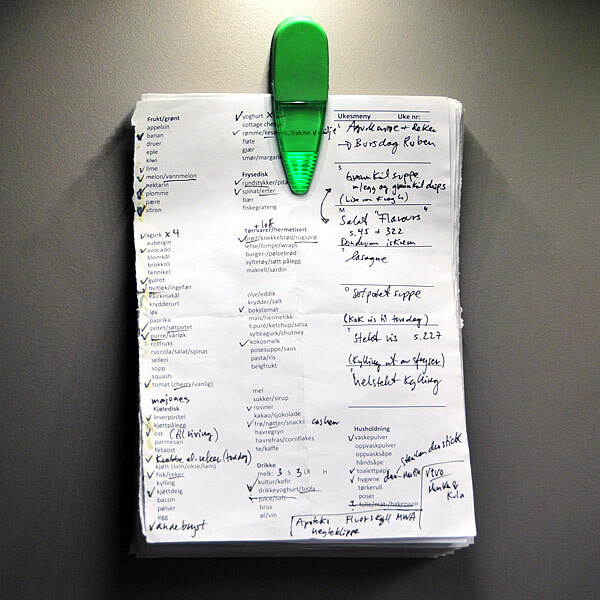 I know there are many grocery list apps available, but in my experience nothing beats paper for this purpose. The superb “resolution” of paper gives you a full overview of the weekly menu and the shopping list on a single, small, A5 sized piece of paper. It can be folded and put in a pocket. There’s still plenty of space for notes, and if you need more space you can use the back as well! The grocery lists can easily be archived. I usually print 10 or 20 copies, and when I’m out, I quickly review the last couple of weeks to see if there are items that should be added or deleted from the generic list. You can imagine how a number of items entered the list when the kids where small, and have now again left the list. The one thing that is certain is that no two persons will end up with identical lists. The list will always be a work-in-progress. For the menu part I often simply include a page number if the recipe is from a cook book, and since I remember which book the recipe is from, a page number will normally suffice. The nice thing with including the menu on the grocery list is that it serves as an additional reminder when I’m in the grocery store. A quick glance at the menu may often remind me of those last items I forgot. Some may prefer a more inspirational approach to their daily cooking, based on what is fresh and available in the grocery store and what they’re craving for that day. If you have the time, that’s great. But with a full-time day job and family obligations, I don’t have time for that. In Norwegian this is known as “tidsklemma”. There’s no proper English translation of that term, but A frog in the fjord has a nice explanation of it! Nonetheless, an important rule if you shop weekly is to sometimes deviate from your weekly dinner plan! If we’re spontaneously invited over to friends – of course we go, even though we technically speaking had plans for dinner already. Other days, when we’re totally exhausted, we might end up with a thai take away. But on large, planning dinners one week ahead makes us cook more than we otherwise would have had time to. If you want to give it a try, you can download my latest list as a Word document in Norwegian A4 size or English A4 or legal size. Give it a try, and let me know what you think in the comments! Glad you’re back I subscribe to your blog because I love your scientific food posts like your chinese ginger milk pudding post! Keep on writing for your readers! Welcome back. I great surprise in my inbox! To the right there are subscription options both from Feedbruner and Feedblitz. Did you try any of these? I just found your blog some weeks ago. Currently I’m trying some recipes from Textures, because I have many different hydrocolloids laying around, but didn’t know what to do with them. I made some modifications to your ginger milk curd to make it more stable and to my taste and it is fantastic. Heat the milk with Agar and the sugar to 95-100 °C and chill in a water bath to 65 °C. This gives a firmer texture and the ginger flavor content in the original to sharp for my taste. Thank you for your awesome content. Have you updated any of your wonderful hand outs?